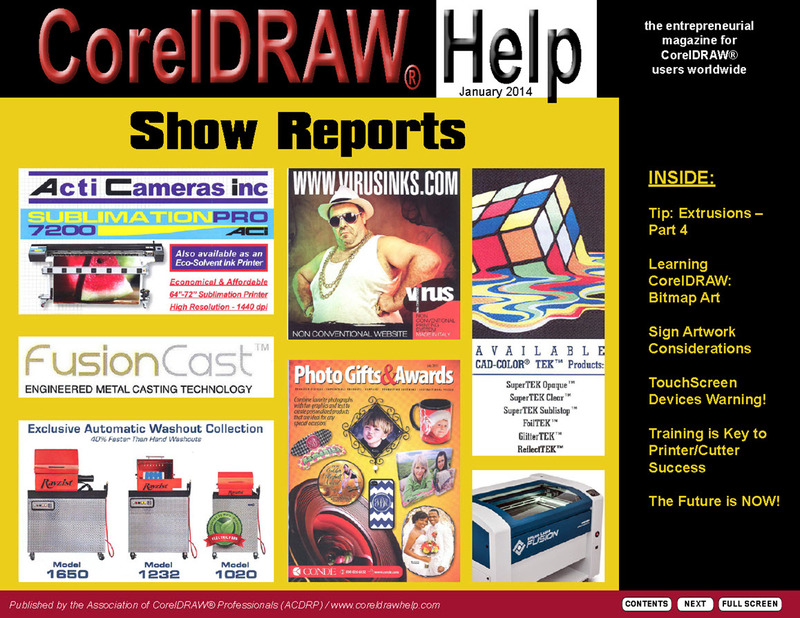 Learn about our new columns, new websites, and show reviews of new products! Learn how a computer stores and manipulates information and what bitmap art is, both monochrome and color. Learn how to use the Color Shading Option to create smoother curves and shading that yields a better print output. Producing artwork for signs depends on the process you intend to use and the original art you are working with. Warning! Not All Touchscreen Devices Are Created Equal! 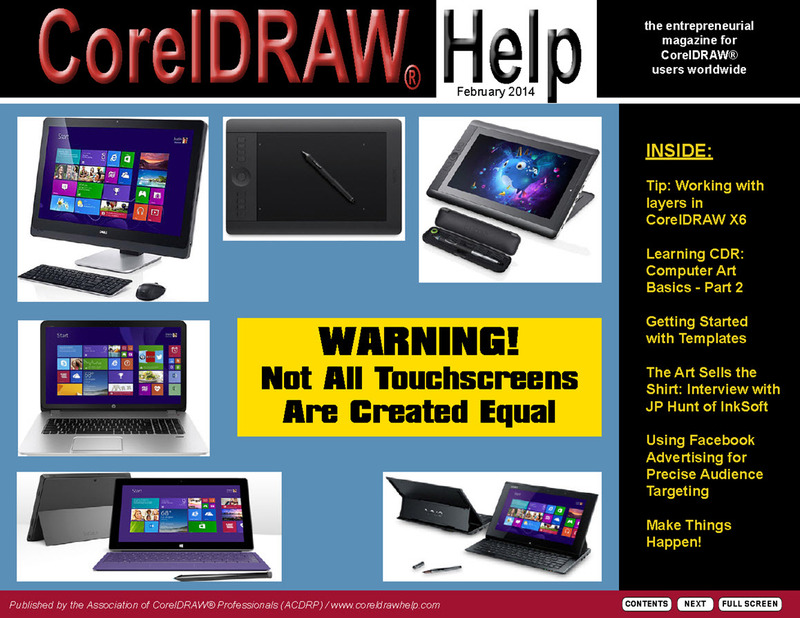 Find out why using a touchscreen for artwork requires a stylus, pressure-sensitivity, and compatibility with Corel products. Thirteen new products are highlighted from the NBM L.A. show. Thirteen new products are highlighted from the ISS Long Beach show. What kind of training is needed, how to stack your deck, and how to load the media. To plan for the future, we need to consider trends, service, value, technology, firing customers, and your company vision. Learn three ways to build your creativity even while facing daily routines. Learn about the anatomy of a computer photo, the basics of image resolution, and ways to change the resolution of a bitmap image. Learn how to use layers to organize your artwork, reduce work time, and increase the accuracy of your designs. 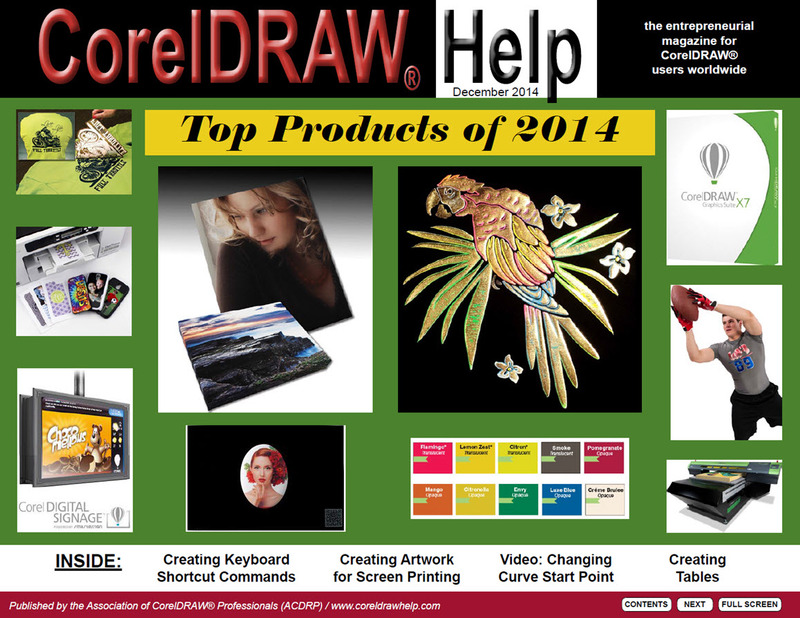 Seven reasons for using templates and how to use templates in CorelDRAW. Which touchscreens meet specific artwork requirements, and which do not and why! Discover the real power of Facebook advertising, and why you need it for your business. Why customers are not buying T-shirts; they are buying the message you put on them. See how to maximize that value. How to fill your sales pipeline and why it’s important to appreciate the gold! 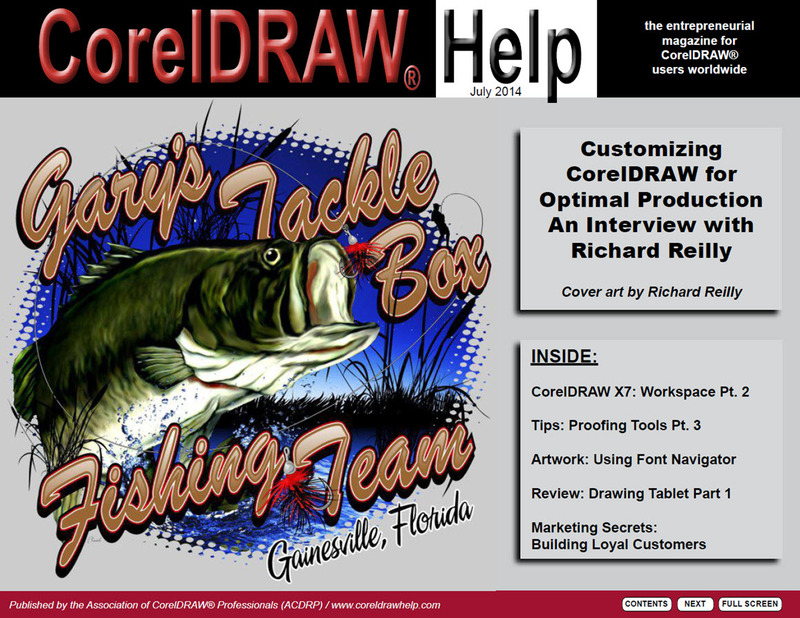 Learn how Corel’s new Fill Tools capitalize on the deep value of Fill. Learn the basics of vector art and how it compares to bitmaps. Learn how to use the Shape Tool’s control handles to improve kerning, line spacing, and combining or breaking apart Artistic Text. How the new features in X7 will help you customized your workspace, gain more speed and efficiency, use new design tools, and find new ways to share. Fine-tune your shop’s operation by focusing on standardization, details, clear expectations, training, and communication. Winter’s Over: Get Your Mojo Back! 16 ways to rebuild your enthusiasm for your business after a slow season. Learn how to visualize a better business! Learn how to set text on a curve — step by step on an open or closed path. See how to round a corner, or create a scalloped or chamfer style with various options. Learn how to use Bezier curves and when to use cusp, smooth, or symmetrical nodes. Windows XP, 7, or 8.1? See why Windows 7 may be more advantageous than upgrading to Windows 8.1. How to install X7 if you have a Corel Premium membership. 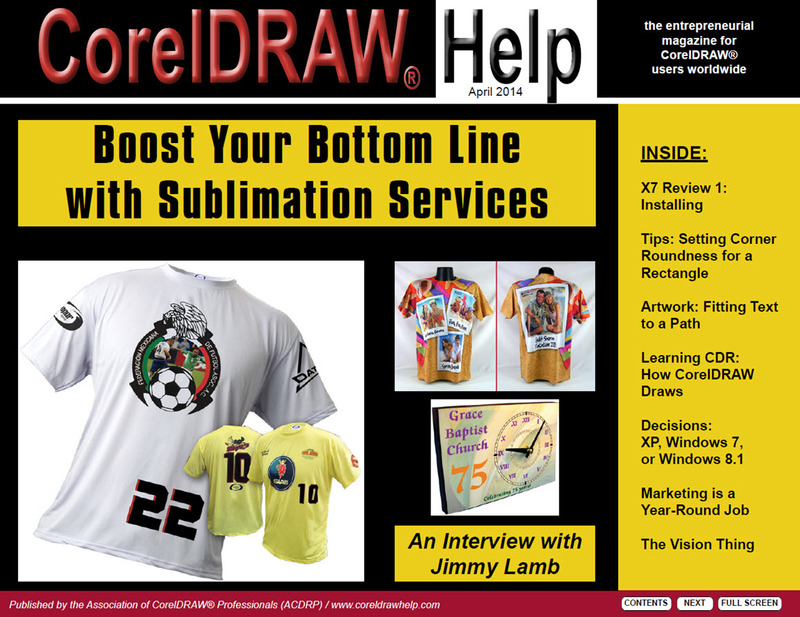 How to use sublimation to increase profits and why it’s different from transfers. Marketing is a Year-Round Job! 15 ways to “market” your business on a regular basis. See 5 ways that Orders make a difference in our business. Learn how to create multiple-piece orders three ways – step and repeat docker, transformations docker, and imposition layout. 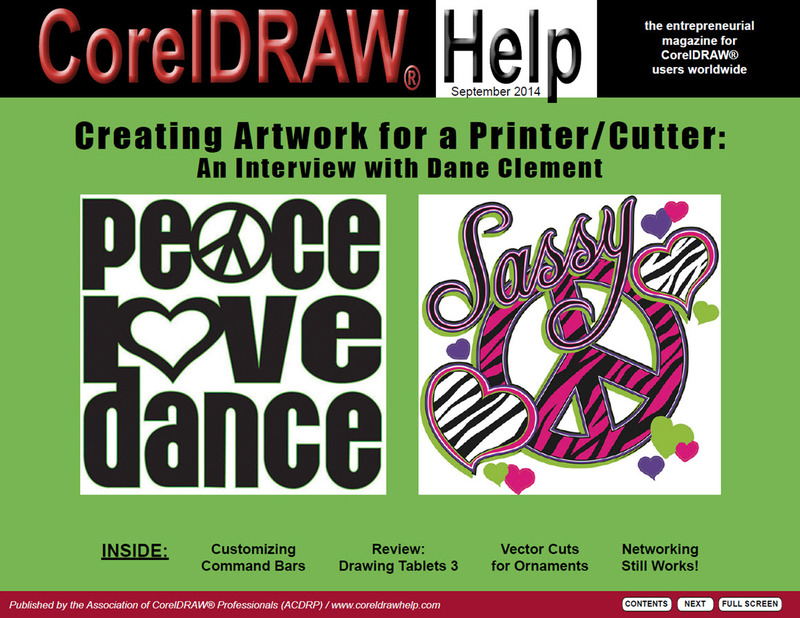 Learn how to access color management in CorelDRAW and match your customer’s color needs. Learn how to use language codes and common buttons to proof your documents. Learn all about higher-order graphic objects, object order, arranging and combining objects, and the use of PowerClip. The new X7 Welcome Screen gives you a new Help section, a Gallery, new workspaces, updates, and more. Learn specific tips for managing RGB and CMYK channels for color separations. 15 ways to keep your balance when swamped by orders and tasks. How customer contact interfaces are as important as computer interfaces. 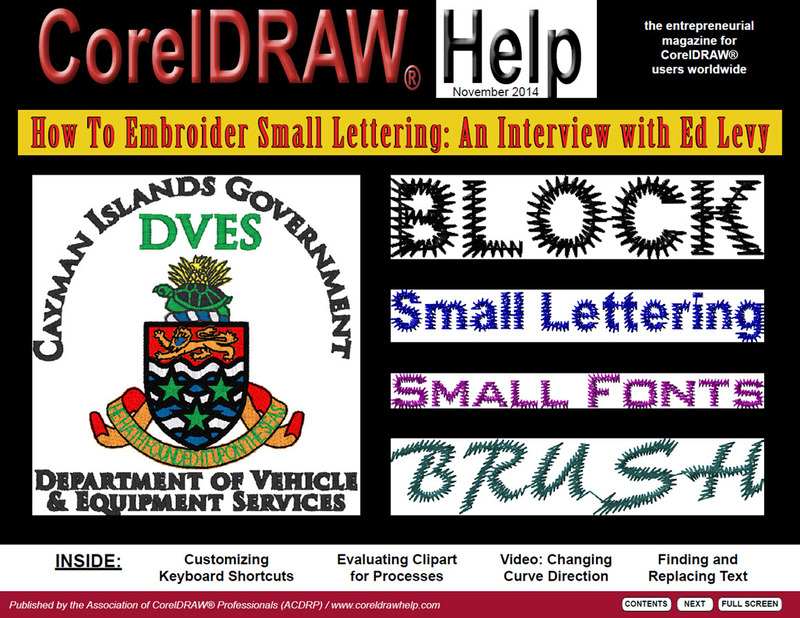 Learn how to use the Spell Check options in CorelDRAW to avoid errors. 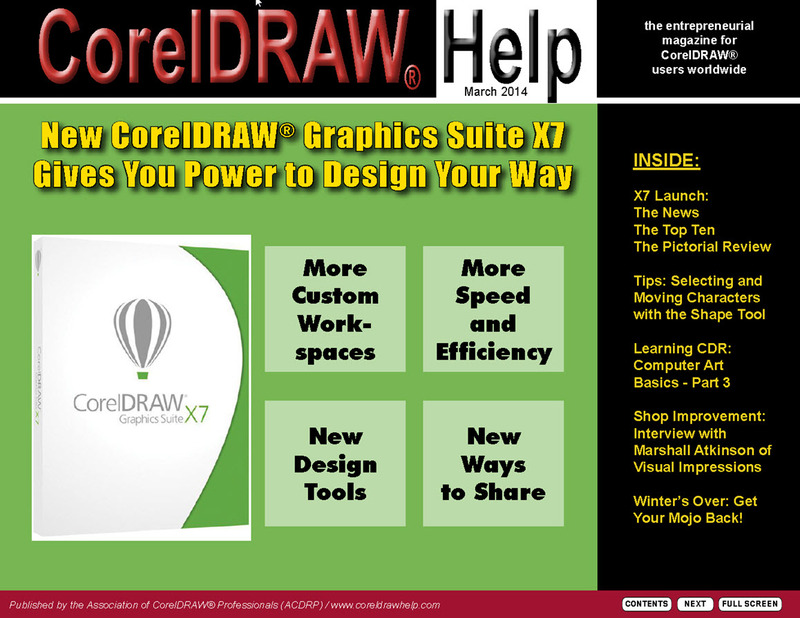 Learn about new features in the CorelDRAW X7 default workspace and the variety of custom workspaces that are available. Learn why single black-and-white images are needed for most sandblast processes. Learn the differences for artwork creation in using six different interface options—keyboard and mouse, trackball, touchpad, touchscreens, keyboard and drawing tablet, and touchscreen drawing tablets. Learn a range of tips to add Photo Power to your marketing arsenal. 10 ways to constantly promote your business! Three ways training makes sense – and cents! Learn the difference between Main Word Lists and User Word Lists for proofing. Learn how to customize your workspace by setting the Command Bar Icon Size and the Color Palette. How to organize and catalog your fonts for ease of use. 7 features to consider in buying a drawing tablet. Customize your screen by adding your favorite tools, macros, and dockers to fit your particular needs and open up a cleaner workspace. 13 ways to keep your customers coming back. Five ways to use heat (enthusiasm) to your advantage! Learn to use the grammar checker and thesaurus that are built in to CorelDRAW. Explore the standard features of the PHOTO-PAINT workspace and standard workspaces that are available. Discover how to use wireframe mode, the shaping docker, boundary tool, contour tool, and smartfill to prepare art for vinyl cutting. Learn how this Wacom tablet can add touchscreen capability to a non-touchscreen desktop computer! Learn how to customized templates and color palettes in CorelDRAW for ease of use. Nine ways to re-vamp your business for greater appeal. How the six keys to deeper learning are alive and well in our industry businesses. Explore how to use the Bevel docker to customize your bevels with depth, color, and lighting options. 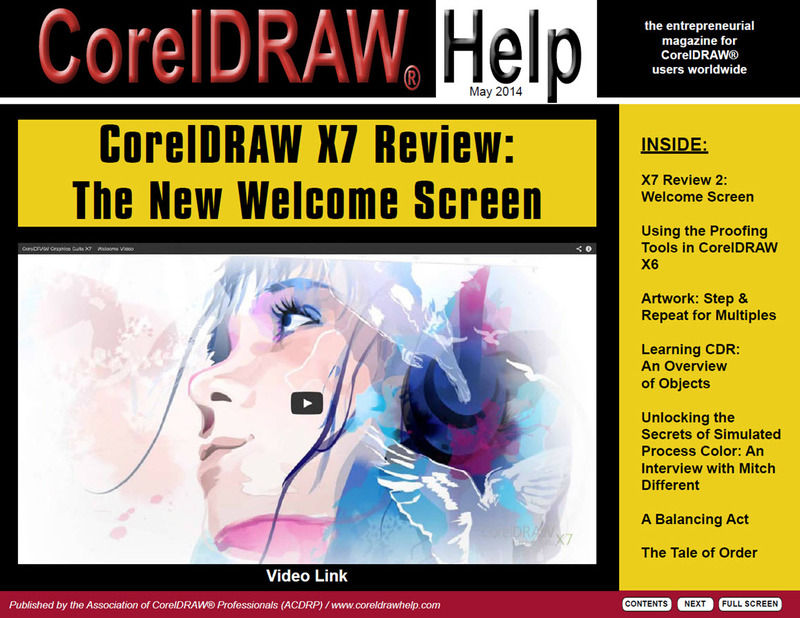 CorelDRAW Graphics Suite X7: Turning Command Bars on & off. Learn how to turn command bars on & off in CorelDRAW and Corel PHOTO-PAINT workspaces. See how to achieve proper Cutting Order with layers, groups, and objects that contain sub-paths. Compare how the Wacom tablet draws with CorelDRAW, with Corel PHOTO-PAINT, and with Corel Painter. Save time in making signs by designing your artwork to weed in one piece. Push your business to the next level with these 12 rules for good networking! Consider the value of calling on customers and selling promo products and awards. Thanks to our writers, sponsors, and readers as we start our 8th year of publishing this magazine. Learn how to set the options for Corel’s auto correct feature. CorelDRAW Graphics Suite X7: Customizing Command Bars. Learn how to add commands to a command bar, reset command bars, and create a new command bar. Discover how node sequence controls the starting point and direction of vector cutting. See how to use Imposition Layout to print multiple images of the same layout. Introducing 10 ways you can get training using our online services! Learn how to use spraying and foiling techniques to create low-cost special effects. Eleven ideas to make networking easier and more enjoyable! Wayne McKnight, The Recognition Creed, and the World Series. Remembering Wayne and Appreciating the Recognition Creed from the Colorado shop. A look at how 4th grade lessons focus on language features that are fundamental to graphics arts. 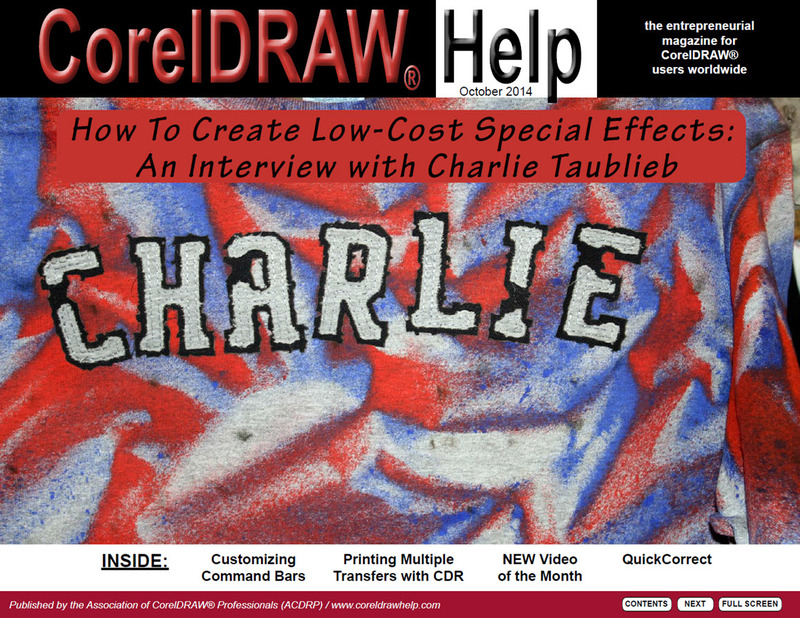 Learn how to effectively use the Find and Replace option in CorelDRAW. CorelDRAW Graphics Suite X7: Introduction to Keyboard Shortcut Commands. Make your workflow more efficient by mastering keyboard shortcut commands; see where you can locate all of them that are available. See how to change the curve direction of vector objects to match the cutting direction. How you set up your artwork job depends on the type of output process you will use; see the parameters for most industry processes. Introducing 10 ways you can get training using our online services! By popular demand, we repeated this article from last month! There are ways to create embroidered letters under 3/8 inch; learn several options, from choosing the right font to using a smaller needle. This is an inspiring article about 11 aspects of running an industry business that we all need to be grateful for. Veteran’s Day, Sherryl Wilkinson, Eddie Cardenas, Bob Sherrod. Remembering Bob, Appreciating Sherryl and Eddie as well as all veterans! A look at how important it is to fill our bucket with things that keep us healthy and balanced to counteract all the stressful drains of our daily work. Learn how to use the Table Tool in CorelDRAW to make some layouts easier. CorelDRAW Graphics Suite X7: Creating Keyboard Shortcut Commands. Just think, if you could create your own keyboard shortcuts for the commands you use most often! What a timesaver! Find out how here! Learn when and how to change the curve starting point to avoid unnecessary problems in using your artwork for machine cutting operations. Here is a clear, concise description of how to set up artwork for screen-printing, including process vs. spot color, choking, and trapping. Review the top 30 products of the year chosen by our editorial team on the basis of innovation (originality) and impact (high influence on sales or productivity). Learn best practices for bringing the curtain down on your past year. December, PMANC, SAAC, and A Toast to Friends. Learn about the new leaders for two Promo Product associations, their yacht meeting, and enjoy a toast to friends.